Today is Sew Mama Sew's Giveaway Day! If this is your first time visiting my blog, welcome. And for all of my regular readers, I'm always happy to offer up some giveaway prizes to thank you for being such a wonderful support network for me. Today, in the spirit of the season, I'm giving away some really fun holiday-themed prizes. Three different winners will each win one of the fabric-covered Moleskine journals pictured above. I made these with Kate Spain's wonderful "12 Days of Christmas" fabric using my favorite tutorial from the wise craft blog. I made these to feature the tutorial in the holiday issue of Fat Quarterly, and now I want the journals to come live with you! 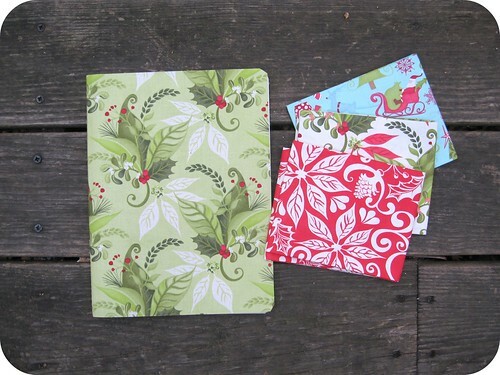 Each journal will be paired with 3 fat quarters from Kate's line. I was planning on taking photos, but the weather gods have been less than cooperative. It's been raining here in North Carolina all weekend and I am WAY behind on my picture-taking. I'll update this post as soon as I can get some decent photos. I always do my giveaways the same old way: simply leave me a comment. That's it! Everyone has an equal opportunity to win. I'll leave the giveaway open until Friday, December 17th ... after which I will let Random.org select my winners. Good luck! PLEASE NOTE: this giveaway has now ended. The winners will be posted shortly. For more information about Giveaway Day and learn about all of the the other great prizes being given away all around the blogiverse, head on over to Sew Mama Sew! Giveaway Day: Handcrafted Items AND Supplies / Materials! Thanks for a great giveaway. Love the fabric choice. Love those journals! I am off to check out the tutorial. Those are such pretty fabrics ... thanks for offering a chance to win! I think the skating journal is the sweetest thing I have seen in a while! It's always a pleasure to read your blog, and your journals are wonderful. Thanks. Love the journals, and would love to win. 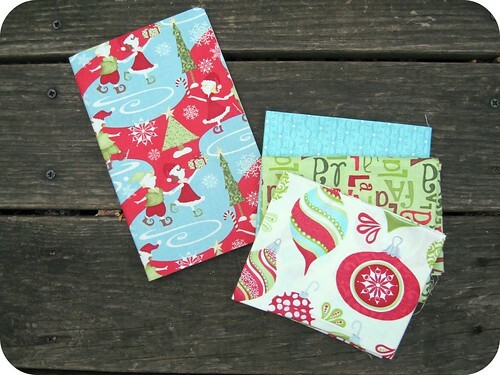 I love 12 Days of Christmas and would love to win a journal covered in that fab fabric. I really like those journals!!! Love that fabric line - the journals look great! Oh I love this frabic line! I missed ordering it, but maybe sew something of it for next year! Those Christmas Moleskins look really festive. Thanks for doing another giveaway. Thanks for the great giveaway! Such cute journals. Those journals are lovely. Thanks for the great giveaway! I love those journals - and the graph paper journals are my favorite!! Great giveaway!! These look fantastic, thanks for the chance to win. Love the journals and thanks for the link to the tutorial! Thanks for the festive giveaway! Nice journals! Thanks for the giveaway! Those are beautiful! Thank you for the chance! Hoping we get some better weather in NC soon! Thanks for a chance to win! Thank you for the lovely giveaway. Here in MI we have winter storm watches and so far 10 inches of snow! Happy Holidays! I want to win --I want to win!! Love the journals--the fabric is awesome. AND adding to my fabric stash is always exciting!! Cute journals. I have to check out the tutorials. I love covered books. I think it takes me back to my school days when we had to cover our books with brown paper shopping bags before school started. Very cute! Happy holidays and thanks for the chance to win! I just love those journals! What a great idea! Thank you for all your posts and this give away! Love them - thanks for the chance!!! Happy Holidays! Who wouldn't want to win this??? LOVE it!! Great looking journals I will have to check out those tutorials! I would love a chance to win though as this is a very busy time of year. Those would make adorable gifts! Thanks for offering such a fun giveaway! I love the fabic choices! love those journals, it's been raining here like crazy, all our snow we had, is now gone. Love the fabrics, and the journals. Thanks for the chance to win! I love that fabric line. And your notebooks are so cute! i've had my eye on this fabric line!! Love your blog. And that fabric would be wonderful to add to my collection. Yay! Those journals are so cool and I love all of Kate Spain's fabric. Thanks for a great giveaway! Those are so pretty! Thanks for the chance to win! I have always loved your journal covers! you have a fantastic blog!! Always need journals...I use them as sketchbooks, and I love Kate Spain fabric. Thank You! fun giveaway. I have never stumbled on your blog before. fun! Love these little journals...and fat quarters are always welcome! My current journal is nearly full. Maybe it's time for a new one. moleskines *and* fabric?! I'll have to check out that tutorial as well - this could be a perfect project for several people in my life! Beautiful fabric on the journals! Great giveaway :-) Thanks for entering me! beautiful idea - i may have to make those for teacher gifts! thanks for the chance to win! First, LOVE your blog! Love that fabric! Thanks for the chance! Awesome journals...love that idea and the fabric. Thanks for the chance to win. Would enjoy wining for sure! great looking journals, so festive! thanks for the chance to win! I love this fabric line and this tutorial! Happy Holidays! I love these journals - and have since the first time you posted the picture! They're so perfect for this time of year! Beautiful! Thanks for the great giveaway! very cool! please enter me in the giveaway! Great giveaway! A place for my lists! :) Thanks again. How cute! I love that line of fabrics, too! Nifty - if I don't win, I'll have to make some myself. Clever idea! Love the journals! They look so perfectly done. Those look so great. Thank you for the opportunity! SEW sweet!! And my sewing Journal is FULL! I carry it EVERYWHERE!! I write down all yardage for each project that I want to make...that way when I 'find' the perfect fabric I have the yardage that I need!! I also have a list of colours of thread that I need...wool that I could use, books that I read about on blogs...patterns that are on my 'to do list' and so on!! So you can see why it's FULL!! Thanks for the chance to win a brand spanking new one!! Love these! Thanks for the chance to win one! Love your blog. You got me hooked on moleskines last year! Beautiful! Love that fab line and thanks for the link. These would make a fabulous gift! And now I want to make some too! Thanks for the inspiration! Great giveaway! Merry Christmas to everyone! Those look like the gift I have been looking for to give to my kids teachers, thanks. Hi there...I am a new fan of the Quilt Dad blog. Thanks for this chance to win your lovely moleskin journals. I would cherish having them in my home up here in Northern Ontario Canada. So pretty - I thought they were a summer print at first, until I looked at them more closely! So glad I found your blog. Its so fun when I find a new post. Trying to learn as much as I can. Great prizes. Thanks again for your generosity. I love to visit your blog and catch up on all that you make and do. Season's Best to you and yours. Those journals are so neat. Love the graph paper so I can sketch patterns. Thanks for the giveaway, John! So cute! And thanks for the link to the tutorial! These Journals are gorgeous! and extra lovely fabric quarters are always put to good use! Happy Holidays from Toronto Canada! I need to check out that tutorial - those turned out really great! Love the journals and Kate Spain. If I don't win (sigh) will just have to make one for myself. Thanks for the giveaway. I enjoy reading your blog. Thank you for the giveaway. Love your jouranls! It's amazing the things you come up with! What terrific journals! And Kate Spain fabric - yum! Those are wonderful. Love your fabric choices. I am going to have to check out that tutorial. Love the journals! and love your blog!! I love that fabric line. I would love it and treat it with great care. I promise it won't end up in pile in the corner of my sewing room I promise. Love that fabric. I used it to make placemats for my sister as a Christmas gift. Beautiful notebooks - great for holiday planning! Thanks for the giveaway! You're so talented! Thanks for the chance. Thank you for participating, it's so generous! I love your choice of fabrics, thanks for the chance to win. Love the notebooks! And I just can't get enough of Kate Spain this Christmas!!! Thanks for the great giveaway! So great! and it would be perfect to chronicle the season in or save to use as my organizer for next year! Beautiful journals. Thanks for the great giveaway! John, thanks for all the inspiration you send out to the bloggy world. And thanks for the chance to win a beautiful journal. Keeping my fingers crossed. What a great giveaway, those notebooks are great! i love the one with the skaters!!! That line has definitely grown on me! I've even given in and picked up a panel & those fat quarters would be given a lovely home alongside it! Hi, Quilt Dad! I heart that fabrics! Love Fat Quarterly and love these journals! Thanks for offering such a fun giveaway. Thank you for the generous giveaway! I love those fabrics. what a great holiday-inspired giveaway!!! 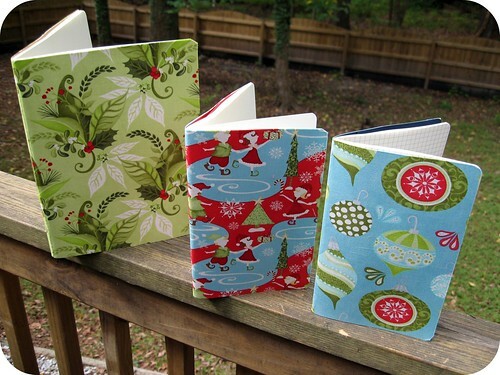 Great journals....love 12 Days of Christmas fabric! I love these. I've thought about making them, but just didn't get to it. They look so pretty. Thanks. Love the fabric! Love reading your blog.....always looking for more photos of Tula! Thx for the easy way to enter. Wow, 140 comments! Happy holidays! The journals are fabulous! What a great prize! 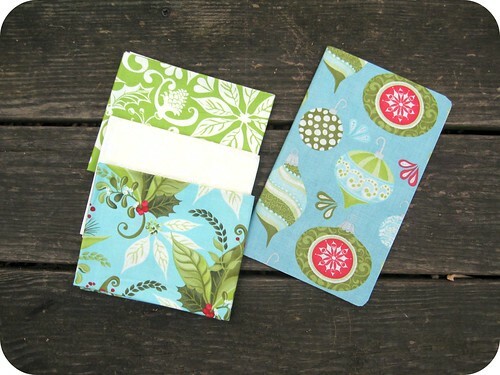 I love Kate Spain fabric, and it looks particularly great on the journals you made. I would love to win one. Thanks for the chance. Oh, I'd love to win those journals! They are amazing! Very cool John, I would love to win your awesome little notebooks! And I don't have any of the prints from Kate's Christmas line so that would just be an added bonus! those are so cute John. Thanks for the link to the tute. Love that line! Just made a tree skirt out of it for our first home! Perhaps with a a bit of extra fabric I could make a matching table runner! Thanks for the chance, love your blog! Thanks for the giveaway-the journals look so ready to write in. Kate Spain is a fav this Christmas. This is my fave xmas fabric.. I just finished making a santa sack for my son from a charm pack. Thanks for the giveaway! I would love nothing more than to sketch quilt ideas in a Quilt Dad-made moleskine journal. Thanks John! Raining? Do you know how lucky you are that you don't live in the midwest? Journals make such a great gift! I know exactly who would get these if I won! The Christmas countdown is definitely on - I hope you & your family have a great holiday! Thanks for such a great giveaway. I love the journals and the simplicity of your sign up. Pick me! I love the journals! Gorgeous! Great giveaway - thanks! Thanks for the chance, I love the 12 Days of Christmas line! Those are just awesome! They would make a great little addition to the bags I've made as Christmas gifts! These journals are so cute. LOVE your fabric choices! Thanks for hosting this giveaway. Thanks for the giveaway, just love that fabric. very nice thanks for the giveaway! Love your blog, love your giveaways! Merry Christmas! I love your blog - always full of inspiration! Another great giveaway! Happy holidays - and thanks for always inspiring! Love your blog -- new follower here! P.S. Your button cracks me up! Best holiday fabric ever. I always enjoy your blog! Hey thanks for the chance. Man I'm glad all of you awesome sewers blog so I can waste half my life looking at your awesomeness;) No, seriously, love your blog!!! Thanks for taking the time to share with all of us idea obsessed people! How fantastic! Thanks for offering this great giveaway! These are so cute, and now I'm totally inspired to make some! These are lovely John, and I'm pleased I found your blog again - you fell off my reader when I moved blogs... yay! I just can't get over how talented you are. Everything you do, I like. It's nice to meet a sewing dad. My older brothers learned to sew as kids from my mom. They used to do mending for other guys while in the Air Force. You have some neat stuff. Your beautiful journals would be really happy living with me!! The ice skating one would look lovely sitting on my sewing table!!! Great giveaway! Thanks!! These are great John. I saw these a long time ago on your blog, and even went and bought the journals… but have I made them yet??? Nope. :) I need to get all over that. Those look beautiful! Thank you for the give-away! Those journals are so awesome home boy! Would love to win -- these are very cool! Thanks from a long time reader! Those journals are lovely. I love moleskines. Love this fabric line...can't get enough! Oooh, I LOVE your giveaway because it's Kate Spain fabric!! I would absolutely love to win! Thanks for the chance. Thanks for the chance to win! I understand your photo troubles. Even here in Florida it is cold and really windy today....if I brought a quilt outside to take a picture for my blog, it might end up three streets over before I could step back and snap the picture! Go Tarheels! those are super cute journals! Is that some graph paper I see on the 12 days journal?! Would be perfect for sketching out some new quilts! I love the Christmas fabrics. I could do some sewing planning in one of these! Fun! what a great giveaway!! 2 of my favs paired up--journals and fabric. Ooh, thank you for the giveaway! I've already moved most of my Yule crafts to the make-for-next-year column, and a holiday notebook would be perfect to put that list to paper! And some holiday fabrics are definitely in order. Whoopee, no hoops! Thanks for the chance to win.